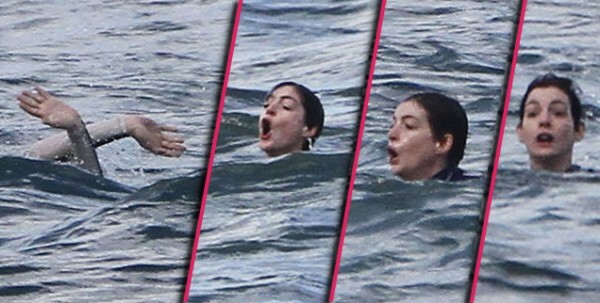 Anne Hathaway Totally Wasn't Drowning, You Guys, She Was Just "Playing Titanic"
Everyone, take note: This is an extremely important story. Apparently, that one time we all thought Anne Hathaway was drowning in Hawaii because, let's be real, it looked like Anne Hathaway was drowning in Hawaii, it turns out she wasn't — she just "pulled [a] Titanic." According to Anne Hathaway herself, rumors of her drowning were "false," and the real story isn't "as interesting" as the tabloids made it out to be. Even though it really, really looked like she was drowning. "I'm fine. ... I really do appreciate everybody's concern but that was a picture that had a false story attached to it. The real story is not as interesting," Hathaway told reporters at Sundance. After, she added that a friend had told her to just tell everyone that she was playing Charades, and just "pulled Titanic." Is she sure she wasn't drowning? Because seriously, take a look at some of those pictures — it kind of looks like she was definitely drowning! And there's no shame in that. It happens to the best of us. Just because she won an Oscar doesn't mean she has to be good at swimming or anything, that's not required. Anyway, Hathaway is at Sundance to promote her new film Song One, which actually might be pretty good.